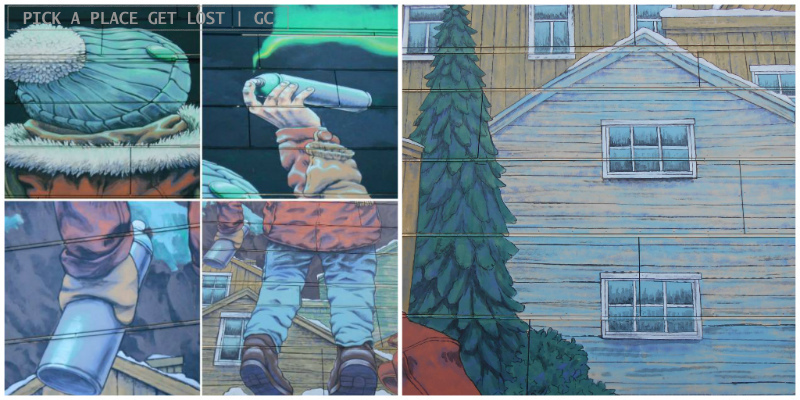 If there’s one thing you can’t help noticing is that street art is a thing in Bodø. 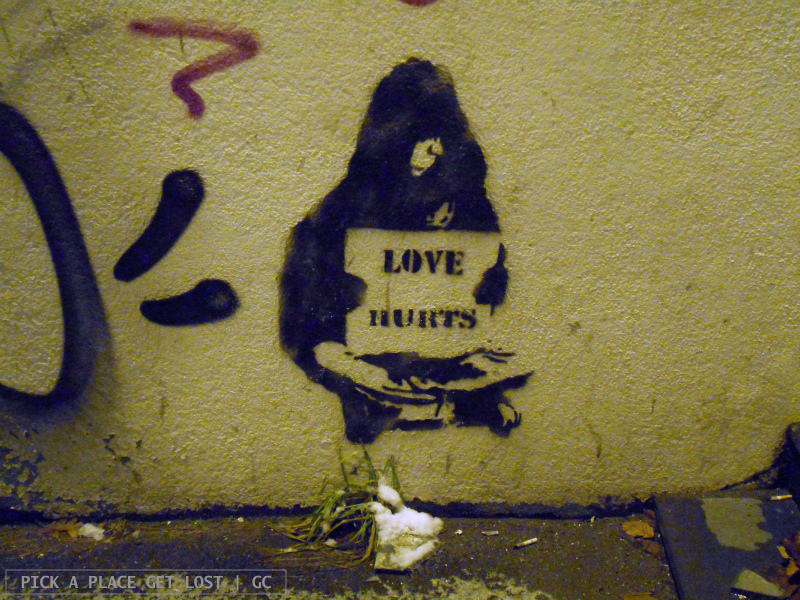 You might fail to notice some graffiti once or twice, only because it happens to be on the wall behind you as you walk down the street. At some point, though, you will necessarily be confronted with its beauties, so you’d better be ready for it. 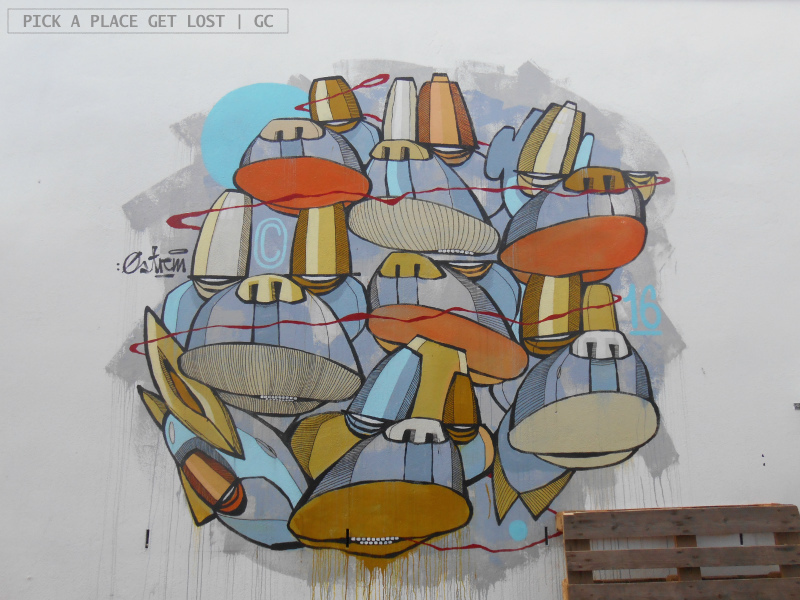 In fact, why not set yourself the goal to (also) devote a couple of hours of your time to a mini tour of the key street artworks around the city? Keep an eye out and, fear not, you won’t miss them! 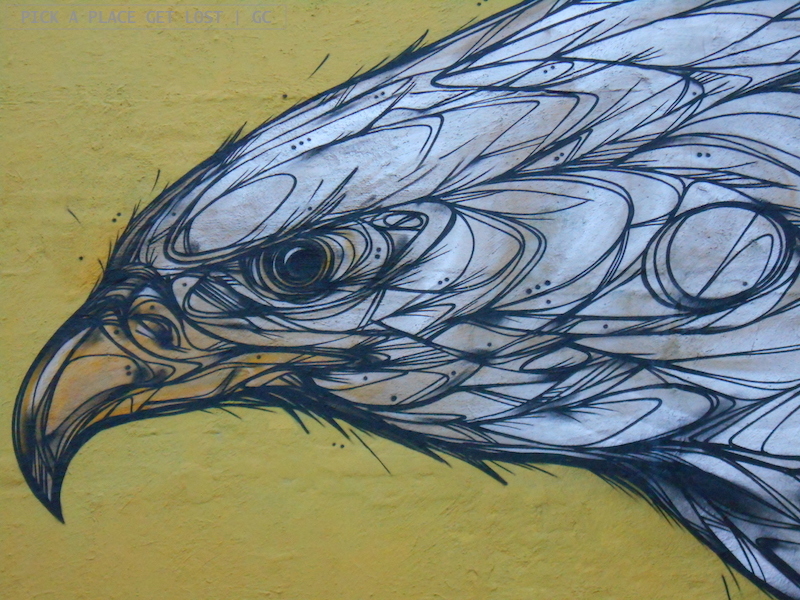 You might wonder why there are so many street art works in a relatively small city. 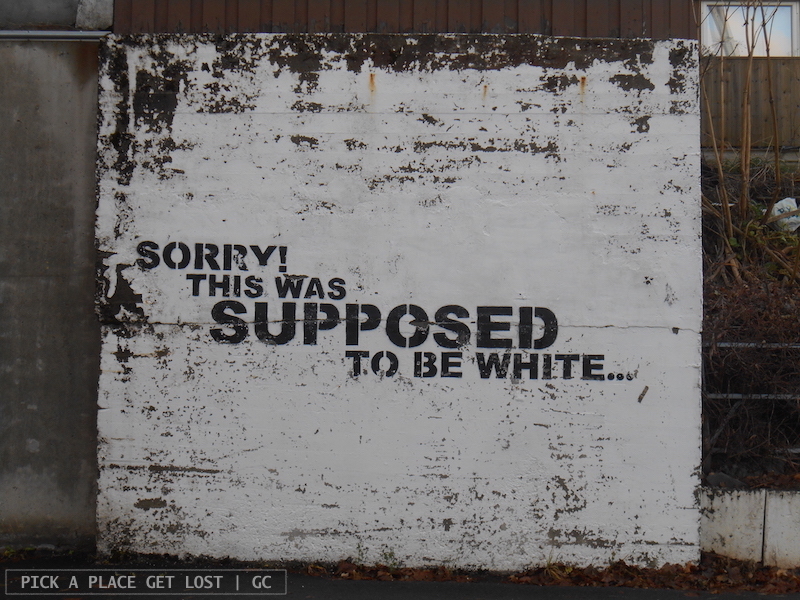 Well, in 2016 Bodø was home to the UpNorth Festival, an urban art festival that first took place in Sulitjelma (in 2015), and drew so much attention and interest that the experiment was replicated, also succesfully, in Bodø. Now, there are six main pieces you don’t want to miss out on. They’re all equally monumental and stunningly beautiful. There’s no specific order to follow to track them down. As long as you know where to find them, you can easily zig zag your way around as you wish. Btw here you can find additional information on the authors and their art styles. I made good use of the tips on offer there, especially when it came to the exact location of each work. So let’s go have a look. I started from the street called Sjøgata, one of the two ‘high streets’ in Bodø (and also the street of my hostel). Walk down Sjøgata from the train station, and keep to the left-hand side of the street. When you reach number 18, stop and turn around. You’re likely to see it just there. What? Well, it’s not that easy to explain. 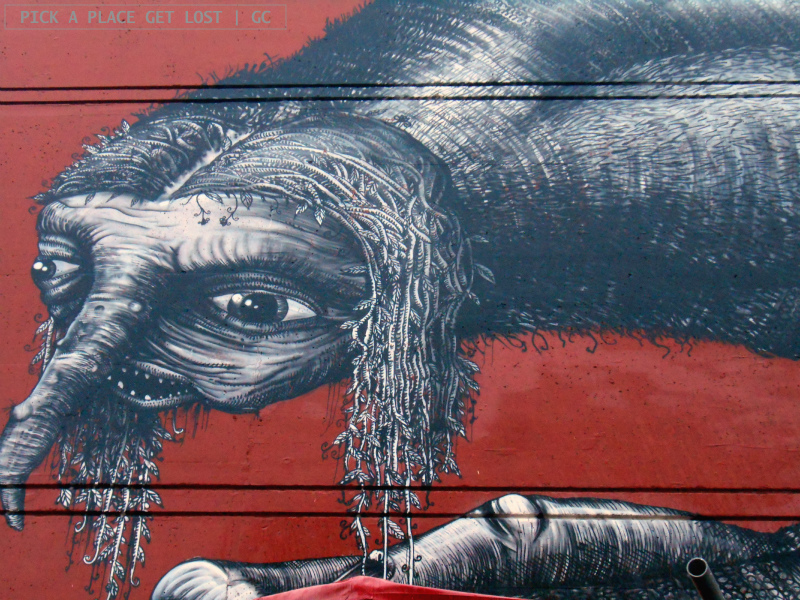 The work is called Phlegm and the author is a British artist by the same name. His works are almost exclusively monochrome and look like they’re out of a storybook. Phlegm is named after one of the four temperaments in ancient Greek medicine (blood, yellow bile, black bile and phlegm), and is no exception. Entirely painted in black and white, it’s a gigantic half-human half-animal creature whose potentially scary effect owes more to its size than to its looks. Its face is all wrinkly and its protruding nose is vaguely similar to a beak, while its hands made me think of a sloth – which also goes well with the title, synonym with apathy. All in all, it is stunning, and the technique used makes it look like a large-scale pencil drawing. Take a closer look and see for yourself. Ready for the next? Okay, if you are, it’s very easy to find. 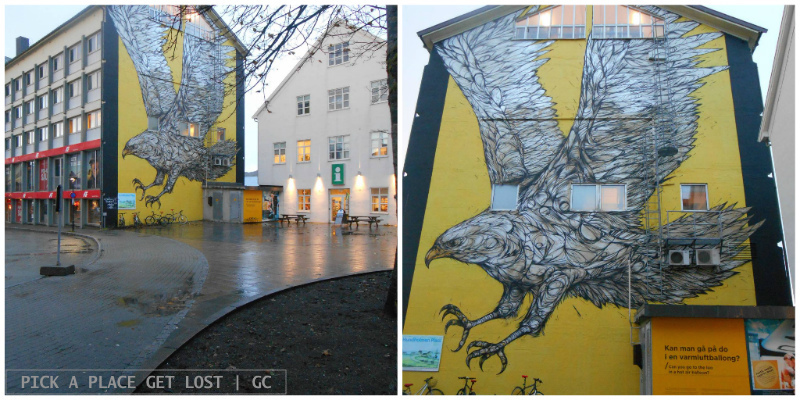 Keep walking down Sjøgata, and… Well, you really don’t need any further directions, because by the time you reach Tollbugata 13 (which runs parallel to Sjøgata), you will be already staring in awe at the Golden Eagle by Belgian artist Dzia. Painted on the wall right next to the Tourist Office, it displays the graphic, kind of geometric style of its author. Its dynamic pose and penetrating gaze, though, are as powerful as they can get. I read that the artist ‘paints quickly and in situ to ensure that the original idea remains true to its form’. I can only imagine what he can do when he takes his time. The next stop is also not very far from Tollbugata. The easiest way to get there is by going back to Sjøgata and walking to the very end of the street. At that point turn left and, just when the streets starts going uphill and curving to the left, stop and look right. 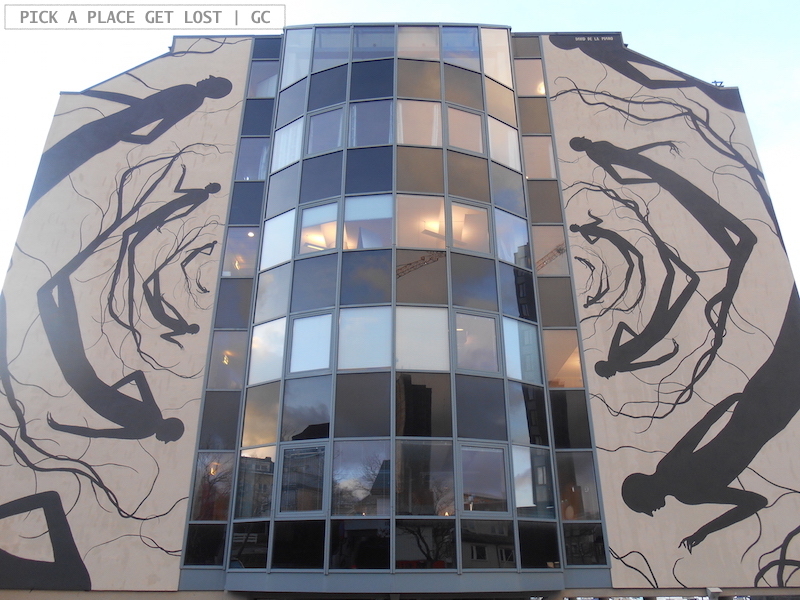 That’s Soløybuilding (address Moloveien 20 fyi), and there, on the wall, is Spanish artist David de la Mano’s Malstrøm. If one had to give a very simplistic description of this work, that’d be ‘a vortex of stick men with root-like feet’, or something along those lines. In fact, the ‘crowd’ of black silhouettes that float all over the façade deserves more than that. The slender figures look like they’ve just been blown away by a strong current they couldn’t resist. Apparently, this kind of monochromatic image is also very typical of its author. Yes, you’ll be standing in one of the most nondescript spots in the whole of Bodø. 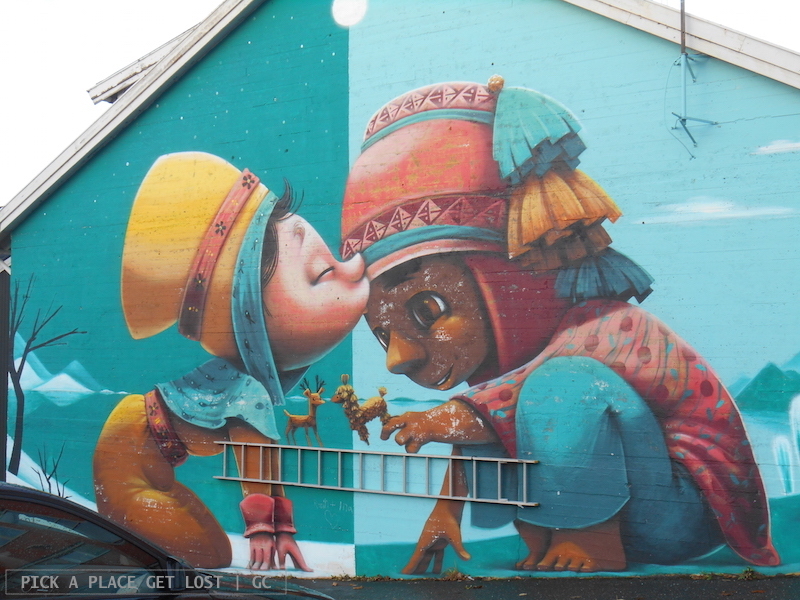 But that also happens to be the location of A kiss between cultures by Animalito (aka Graciela Gonçalves Da Silva), self-taught illustrator and graphic designer from Argentina. And, yes, the car park where the graffiti was painted is indeed as ordinary as a car park can get, yet the colours of the mural are too bright for one to fail to notice it. We’re nearing the end of this walking tour around street art works in Bodø, and the next is not the easiest to spot – at least, it took me a while to realise how and where exactly to find it. The address is technically Storgata 30, but I believe it’s easier to get there another way. From Sandgata 6 just go back the way you came, turn right into Dronningens gate, and keep going straight. Turn left into Havnegata (the third street come across), and then keep an eye on your left. That’s the tricky bit, because you have to enter the small car park that’s right there (this spot is called Tjærandsengården). The mural is on one of the walls overlooking the car park, and you can’t see it from the street. 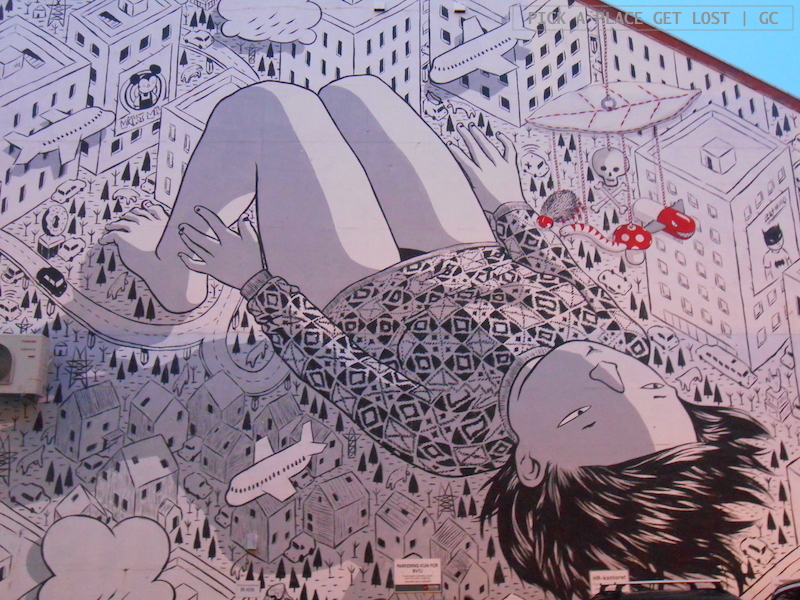 Insomnia, by Italian artist Millo (born Francesco Camillo Giorgino), is a large-scale scene of ordinary, everyday life. I read that in his works Millo uses mostly black and white with touches of bright colours here and there. The window is also a recurring element. One of my favourite things is how he manages to paint such a huge mural, yet make it look like he has jotted it down on a post-it without even having that much time to ‘do it properly’. Obviously, it’s perfect as it is. Okay, I’ve saved the best for last. Or, to be fair, my favourite for last. In fact, this is easily one of my favourite things ever, whether we’re talking about street art of figurative stuff in general. This one I just love. After School, by Russian artist Rustam QBic, is a bit further away from all the other artworks we’ve talked about so far. Go back to Havnegata and walk up the street till you get to Kongens gate, where you have to turn left and just keep going for about five minutes or so. 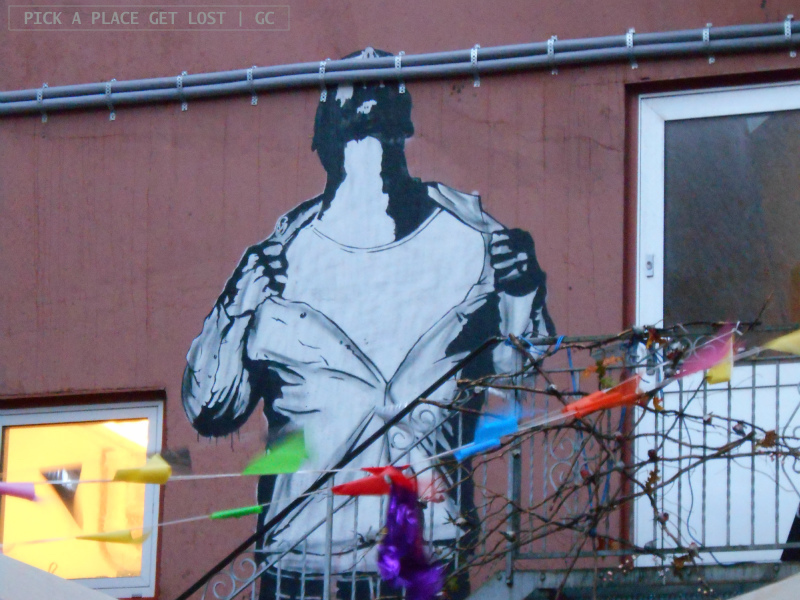 You will know when you get there (the address is Kongens gate 20), because it just doesn’t go unobserved. 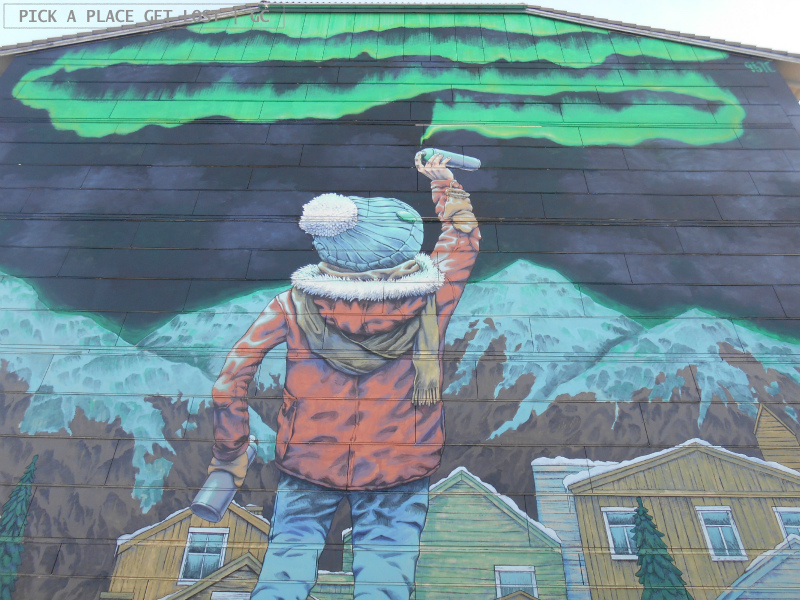 I mean, it’s a little girl painting the northern lights with a spray can, how can you not see it? When I got off the bus from the airport to the city centre, I picked the wrong stop, so I found myself standing in a random street in the dark (8 o’clock on a November night, what do you expect). I had no clue where my hostel was, so I just walked down the street without knowing whether it was the right direction. It really is as the photos suggest: beautiful and superb technique wise. I won’t even go as far as describing the subject in detail, so poetic it is without adding unnecessary extra words to it. I’d just like to thank Rustam QBic for painting it. The UpNorth page highlights the artist’s ability to juxtapose ‘the familiar with the unexpected’. With After School this description couldn’t be any truer. 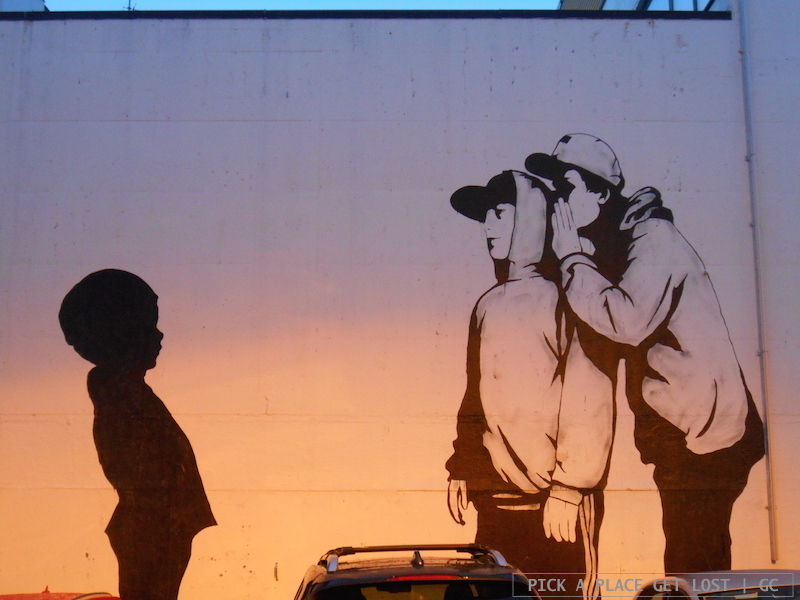 The only large graffiti I came across (while looking for Millo’s work) is one that portrays two young boys wearing hoodies in what resembles a scene of bullying or mocking a third younger, unidentified boy. I honestly and genuinely don’t know whether I’d be able to find it again. It’s somewhere between Torvgata and Havnegata and, again, it’s in a car park. 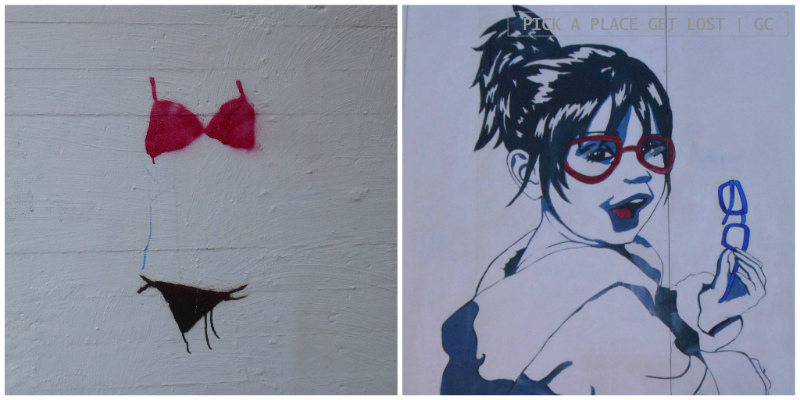 If you spot a black-haired lady wearing lipstick (see photo below), you’re in the right place, as the two pieces were painted on adjacent buildings. – A ‘logo’ of the city, which includes the outline of a sea eagle. Why? 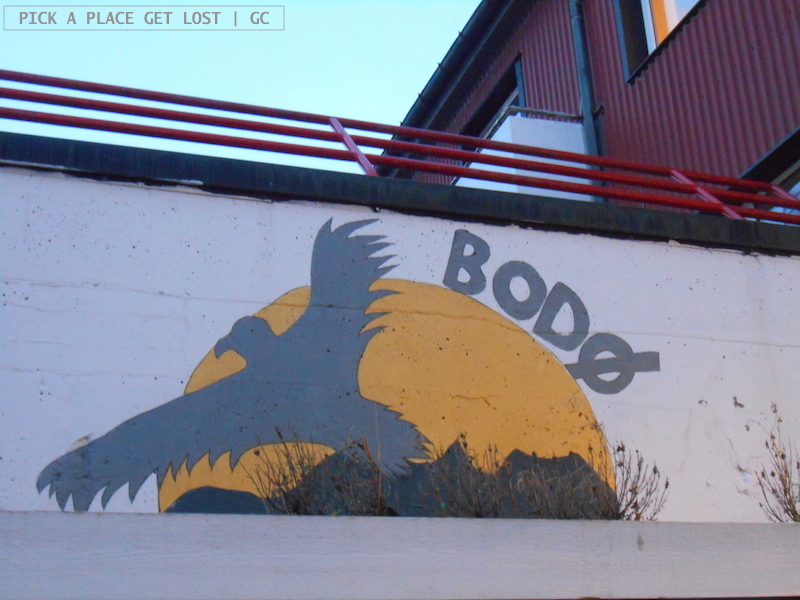 Because Bodø is a city of sea eagles! But that’s another story, so it deserves a post of its own. Maybe the next. 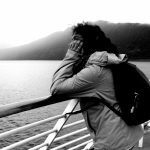 * I do apologise for the arguable quality of a number of photos included in this post. My camera gave me some trouble with focalisation, which at times resulted in not-too-sharp snapshots or light that was, well, not the best, to say the least. This post also appeared on the website Life in Norway on 28 October 2018. Click here to access the page! 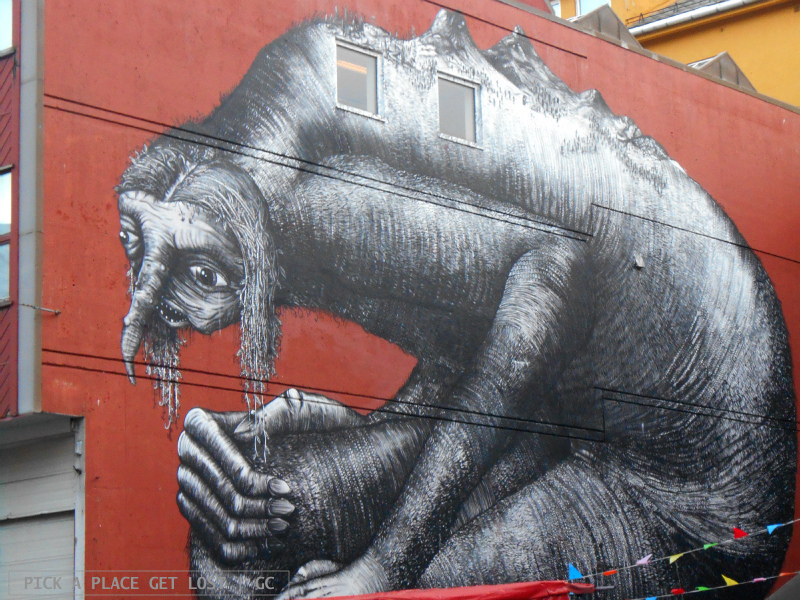 This entry was posted in Norway, Norway 2017 and tagged animalito, bodø, david de la mano, dzia, millo, norway, phlegm, rustam qbic, street art, upnorth festival by Giorgia. Bookmark the permalink.